In an earlier blog post about Rev. Harry Emerson Fosdick, a Union alumnus/professor and the founding pastor at The Riverside Church, I described his ministry to American servicemen and women during WWII despite his fierce commitment to pacifism. The Burke’s collection of Fosdick’s papers covers most of his adult life and prolific career as a leader in liberal theology, spanning the first six decades of the 20th century. Given the significance of The Riverside Church in Fosdick’s life and work, there is a substantial amount of material in his papers relating to the church’s history. One of the more fascinating stories (among many) is the enormous construction fire in 1928 that delayed the church’s opening. 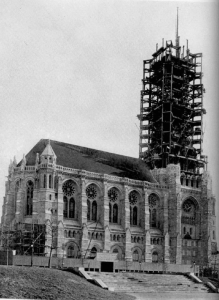 Financed by John D. Rockefeller Jr.’s vast fortune, construction on The Riverside Church began in 1926 and by the end of 1928 great progress had been made. 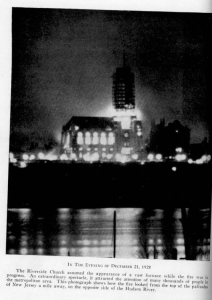 A published photo taken on Dec. 18, 1928 in the January 3, 1929 issue of The Church Monthly shows the 300-foot steel framework of the church’s massive tower (that would still rise another 100 feet) ready to be encased in Indiana limestone. Just three days after this photograph was taken, however, a fire broke out on the night of December 21, 1928 that set the entire wooden scaffolding inside the church ablaze, calling out hundreds of firefighters and thousands of aghast spectators to the scene of the conflagration. The fire was so large and so intense that it could be seen miles away across the Hudson River in New Jersey (the below image is from the same issue of The Church Monthly, Jan. 3, 1929). 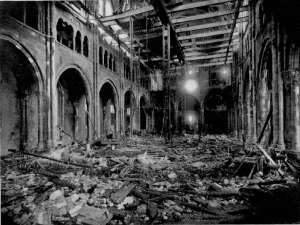 According to Fosdick’s 1956 autobiography, The Living of These Days, the cause of the fire was a carelessly strung electrical wire that wrought enough damage to delay construction and the church’s opening by a full year. Luckily, because the fire started at night, no one was injured or killed; had the flames erupted during the day, when hundreds of construction workers were busy inside, the casualties could have been catastrophic. Two other photos from the same issue of The Church Monthly show the smoldering ruins of the church’s interior and the charred skeleton of its once mighty tower. In his Sunday sermon following the fire, Rev. Fosdick addressed his parish from the pulpit of the Park Avenue Baptist Church (Riverside’s predecessor): “You will understand without my going into details that the church is involved in no loss in this matter save loss of convenience and time. This postponement of our entrance into our new building is a source of great disappointment, but it is the part of a Christian congregation, as of a Christian man, to face such exigencies with fortitude and good-will. In the name of the ministers and responsible officers of the church I wish publicly to express the appreciation which we feel for the outpouring of sympathy and good-will from every side.” The Fosdick papers include sympathy notes, cards, and records of donations from well-wishers around the globe including letters from Scotland, Greece, Japan, Switzerland, Canada, and a heartfelt note from Dean Howard Robbins of Riverside’s Morningside Heights neighbor, The Cathedral of St. John the Divine. Given the fire’s size and proximity to Union Theological Seminary, it is no surprise that UTS sustained some damage. Rev. Fosdick and then President of UTS, Henry Sloane Coffin, exchanged letters in January 1929, in which Coffin declined Fosdick’s offer to pay for the damages. Fosdick declares himself “not easy in conscience about the Seminary having to carry the reimbursement of individuals at 99 Claremont Avenue who lost possessions during the fire” and urges Coffin to reconsider the church’s offer. There are no records, however, in the Fosdick papers to suggest that UTS ever accepted any financial recompense from The Riverside Church following the fire. 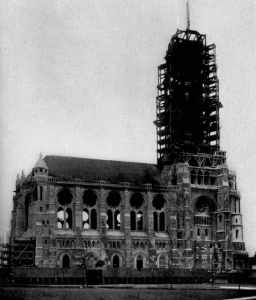 One tangible (and lasting result) of Riverside’s fire was a change in New York City building laws requiring that scaffolding be made of metal rather than wood to prevent another disaster of the size and scale of The Riverside Church construction fire of 1928. If you are interested in Rev. Fosdick, The Riverside Church, or liberal theology in the 20th century, I encourage you to explore the Burke’s collection of Fosdick papers. I certainly plan to dig deeper so stay tuned! This entry was posted in Collections on March 21, 2017 by Meredith Levin.